As you throw your towel down on the sand, anticipating a loose and relaxing afternoon in the sun on one of San Felipe's blonde beaches, cast your gaze eastward and you'll likely witness one of the many masks of Isla Consag, the 296 foot guano-covered rock that rises out of the sea twenty two miles off the town's shoreline. The island seems to have more disguises than Lon Chaney, more impressions than Rich Little. Atmospheric tricks keep the rock in a perpetual morphic dance, at one instant showing its circus midget stature while an hour later it looms out of the sea like an NBA star. The next day it draws a mantle of mysticism around itself and appears as a floating city in the sky. Then the following week it seems content to be, for a while, simply itself. A furrowed rock edifice, crusted white with bird droppings. Warm and cool air, wind, humidity and refraction all come into play to make San Felipe the eyepiece end of a kaleidoscope that rolls the myriad images of Isla Consag against the snap line of the horizon. It's the entertainment of a master hand manipulator throwing shadows on a wall. In a way, the masks of Consag are somewhat like mirages. Mirage is a word that traces it origin to the French verb se mirer: to be reflected. Actually, refraction is the active ingredient in a mirage. The plasticity and shape-shifting showmanship of mirages are totally dependent on atmospheric conditions. When a Consag appears to change position, it is because light reflected from the rock travels through layers of warm and cool air and, because of the layers differing densities, becomes bent or refracted upward or downward making the island appear to an observer at a certain relation to the light, either above or below its true position. Mirages come in different flavors. While driving on a hot day, have you ever seen water sitting on the highway in the distance? This kind of mirage is called an inferior image. What you're actually seeing is a reflection of the sky. Light rays are bent toward your eyes by the hot air above the pavement sitting just below a layer of cooler air. The proverbial lake in the desert is formed in the same manner (which can be quite an aid to real estate salesmen). The image of the sky is refracted to appear at ground level, and because of its blueness, seems quite aquatic. 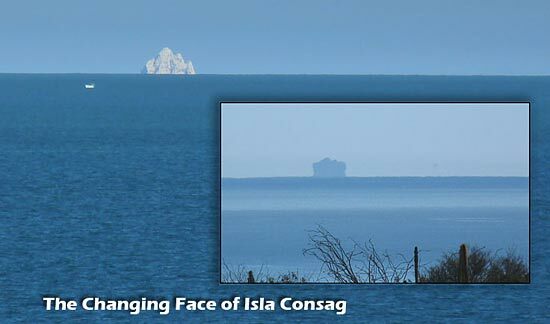 Another kind of mirage, which applies to the Isla Consag, commonly occurs over water or ice. It is called a superior image and takes it process from light rays being refracted downward, making an image appear to float in the air. Also, objects on the other side of the horizon line, not normally seen, may become visible on or above the horizon. This phenomena is sometimes called looming and can magnify distant objects so they appear closer than they actually are. A notable kind of superior image is something called a fata morgana. This atmospheric trick presents the image as a floating city or castle. It requires a particular series of cold and hot air layers sitting close to the surface of the water. The layers superimpose recurrent images on top of each other. These stacked images can often appear as skyscrapers, and hence the city affect.